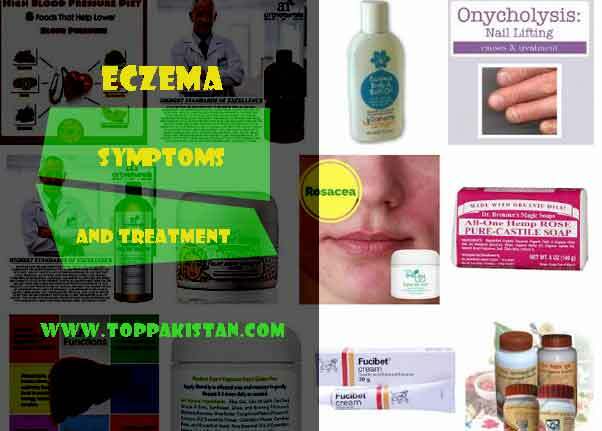 Here we will explain Eczema and Eczema Symptoms and Treatment. If you are allergic to something, there is an outside chance that you may get afflicted with Eczema. Eczema is an allergic condition that affects skin and is also known by the name dermatitis. Medically speaking, Dermatitis is a condition where skin is inflamed. Usually, Dermatitis occurs in many forms, but in its most common form, when explained in context of Eczema, it is Atopic Dermatitis. Atopic refers to a life long susceptibility to allergic conditions such as asthma and hay fever. Eczema is a condition where people are susceptible to allergic conditions, thus it can be triggered by anything coming into contact with skin. Atopic people with greater sensitivity to skin irritation are more likely to encounter Eczema. The onset is marked by appearance of dry and flaky skin over reddish and inflamed areas of skin, which causes intense itching and burning sensation. It does not affect any targeted age group. It is a condition of skin that is very common and can afflict any age group or any race type. Children in early stages are more susceptible to being atopic. Research has shown that approximately 1-2 percent of adult population and about 20 percent of child population is afflicted with Eczema. Case histories show that patients catch it at an early age. Age of five is considered to be a benchmark, which means that one might get the first attack of Eczema before the age of five years. Being a life long condition, it might decrease or worsen. Since it is a condition of the skin, the itching and burning being irresistible, makes it an irritating and frustrating condition. * It all begins with intense itching. * Itching is followed by a rash. The rash is generally flaky or scaly on top of reddened skin which might be inflamed. * Sooner than later, the rash itches or burns. * On being scratched, it might ooze, especially in children. * However, among adults, it might not ooze and be in the form of thick, scaly and brownish patch. * In certain conditions, clear fluid filled heads might form. These give a sickly appearance to the skin on being scratched. * Over a period, skin might develop painful cracks. * Most likely places to find a rash are where excess sweat or oil glands are found. These are face, arms and legs, especially in the folds. – The age old saying “Prevention is better than cure” is best adhered to in case of Eczema. Getting rid of the irritants that may cause the condition is an effective cure. The key lies in finding out what one is allergic to, for example, a paste or milk or even detergent. Changing these irritants can be a good remedy. – Dry skin is like an invitation card for the itching irritants during Eczema. Dry skin condition must be avoided. Warm water showers can do it for you. Be sure to use a non allergic mild soap. Keeping the skin free of excess moisture and removing the excessive dryness with moisturizing lotions is a good idea. – Tight fitting clothes can worsen Eczema due to non ventilation. These must be avoided. – Although difficult to achieve, avoid scratching the rash. Keeping the affected area under dressing is may be good idea to avoid itching. – Irritation may be enhanced by sweating. In case you are facing a flare of itching, avoid work that may cause sweating. – The diet should be targeted so as to control Eczema. This can be found out with various permutations to arrive at a diet that may be suitable for you. – The diet during Eczema should be so targeted as to not leave your skin dry and irritable. Avoid foods like chocolates and eggs or even meats that might cause dryness of skin. – Once the treatment of Eczema has been completed, one must take care to find out the most suitable diet to be taken during the recovery phase. Anything that can cause a flare must be avoided at all costs.